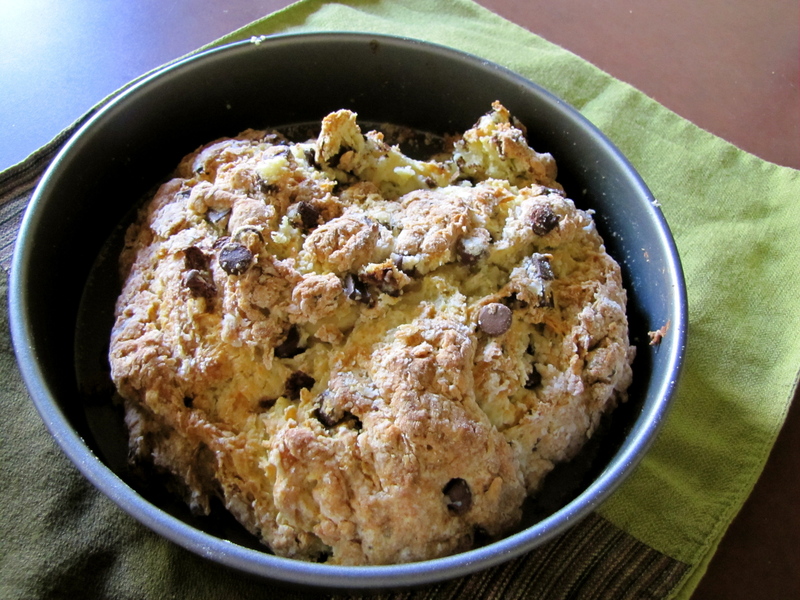 Chocolate Chip Soda Bread – Voila! This isn’t bread so much as a giant scone. I’m not complaining because it’s rich and chocolatey and is best eaten when smeared with berry jam. I made it to eat for breakfast, but in the future I’ll reconsider it as a possible dessert item. Preheat oven to 350. Grease 9″ nonstick round pan. 1. In the bowl of a food processor, add flour, baking soda, baking powder, salt and sugar. Pulse 10 times in 1-second intervals to combine. Add butter cubes and pulse into mixture resembles course meal. 2. Pour mixture into large bowl. Add chocolate chips and combine. Stir in yogurt. Knead in bowl until dough forms. Mold into 6-7 inch loaf and transfer to pan. 3. Bake 45 minutes until golden brown and cooked all the way through. So delicious. Thank you for sharing the recipe (and the bread itself)!